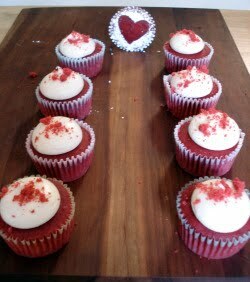 swEEts by e: Are you ready for THE BEST Red Velvet Cupcake Recipe? 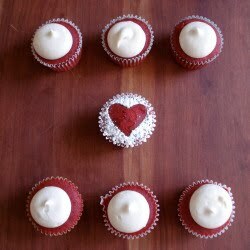 Are you ready for THE BEST Red Velvet Cupcake Recipe? 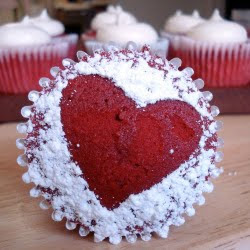 THE BEST Red Velvet Cupcake Recipe. Yes ladies and gentleman, you heard right.. the best. 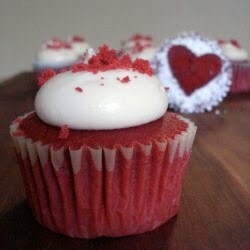 No question about it... this is the best light, fluffy, moist, red, velvety perfect cupcake. I mentioned in my previous post that I had a couple recipes for these tricky little cupcakes that I wanted to give a try before I made my final decision for the wedding. 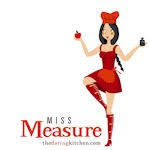 On Wednesday I got to The Sweet Factory ready to try one out... everything was going well- the batter had a good texture, good taste, so I filled up the cupcake liners and popped em in the oven, very excited. And then I saw them...2 large, white, staring at me in the face, eggs laying right their on the counter.. I forgot the eggs! FAIL. Giving myself a couple of days to re-coop from my failure, I told myself the next batch I made would be my last...the best. One bite. We looked at each other, mouth full and nodded. One small "Yes" and we knew. Preheat oven to 325. Line cupcake pan with paper liners. In a small bowl mix cocoa powder, food coloring and boiling water- set aside. In a large bowl, beat butter and shortening until blended. Beat in sugar until light and fluffy. Add egg one at a time, beating after each addition. Stir buttermilk and vanilla into cocoa mix. Alternate adding flour, salt and buttermilk mixture into butter/sugar mixture. In another small bowl, sprinkle baking soda over vinegar and mix. Pour over batter and mix until incorporated. Using an ice cream scoop, evenly distribute batter among cupcakes. Bake for 30 minutes, until toothpick comes out clean and cupcake springs back to touch. Remove cupcakes from pan to allow for cooling and place on cooling rack. Once cooled, frost with Cream Cheese Icing or White Chocolate Cream Cheese Icing. Never try another a recipe again..
just love getting their picture taken.